The roads have been a big issue recently. There’s no getting away from it, the two cold snaps earlier this year (along with last year’s cold weather) have taken their toll. The council’s teams have been out systematically repairing the borough’s roads and evidence of their work is visible across the ward; take a look at Lavender Hill, for example, which has seen extensive repair work. But it’s worth repeating that you don’t have to wait for the council to see the problem and repair it. 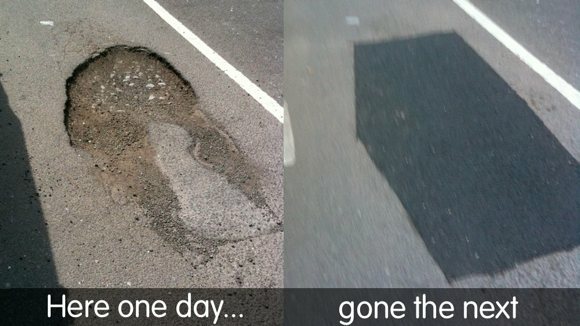 If you know of any potholes let the council know (you can report them at wandsworth.gov.uk/streets). To show how it works I noticed and reported the pothole on the left while campaigning in Sugden Road one night. By 10am the following morning it had been inspected to assess the repair needed and by the afternoon it had been repaired. Not all repairs can be completed in 24 hours, but we always try and get to them as quickly as possible.